I don't usually add anything to my daily cups of tea. I don't even like sugar in my iced tea. I always ask before ordering one, to make sure it isn't pre-sweetened. As you can imagine, I am a born and raised in the Northeast. The only time I like sweetener in my tea is when it's bubble tea, chai, or Thai iced tea. Those sweet treats are usually an occasional indulgence. But over the last few weeks, I've had my share of sweet teas with HK style milk tea, and more than one bubble tea. But when Yosh O. and I went to Qi, a new Thai joint midtown, I felt the pull of the milky, sweet Thai iced tea. I noticed it on the menu, and it just got stuck in my brain. Like the little devil that sits on your shoulder, trying to tell you what to do. 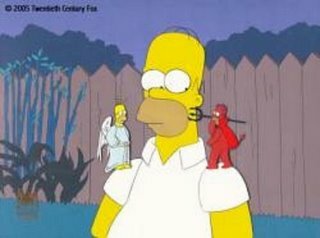 But there was no angel on the opposite side, convincing me to make a healthier choice. We ordered everything to go, and I was surprised to see that the tea was in a bag. When I've ordered a tea to go in other restaurants they usually give it to you to hold, to make sure it doesn't spill. After walking about a block, I peeped into the bag, thinking I'd take a sip while we made our way back to the office. 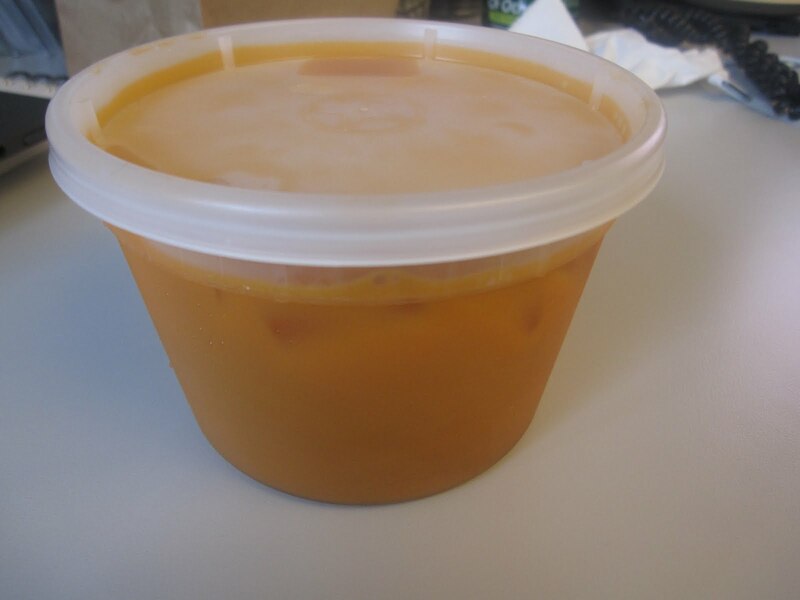 I was looking forward to a cool sip of iced tea, when I was confronted with a soup container. The tea was in jail, sealed shut with an airtight lid. How strange, and disappointing! The tea sat in the bag mocking me while we took the long walk back to the office. I had a large ceramic cup at my desk, so I thought I wouldn't have to slurp out of the plastic soup container. But I was very thirsty, and also worried that my attempt to pour the tea into the cup would result in a sticky keyboard. So I drank from the plastic container. It was almost like drinking from a tea bowl...almost. Despite the hassle, it was actually very good Thai iced tea. Much better than what I've had in most midtown restaurants. It was sweet, but the strength of the tea came through, as did an interesting flavor I couldn't identify. Possibly tamarind? It could be star anise, which is a typical Thai Iced tea ingredient, but I didn't taste licorice. Since the restaurant had just opened a few days prior to our visit, I'm guessing that they didn't get their order of take-out beverage containers. At least, that is my hope. When I return to the restaurant, I'll probably order the tea only when I have time to dine-in, just in case. It's time to cleanse myself of all the sugar, condensed milk, and artificial additives that I've consumed over the last couple of weeks. What better way than with many, many cups of tea. No, I've heard that Thai iced tea is served in a plastic bag. I wrote about it a while back (http://lahikmajoedrinkstea.blogspot.com/2011/03/thai-tea.html), and it was one of the comments I got about it. I'd like to make my own Thai iced tea at home, but I haven't yet assembled the ingredients. You're inspiring me to do so sooner rather than later.